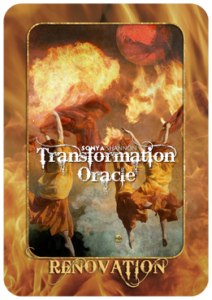 I truly believe that transformation is continuously taking place every day of my existence. In the 26 years I have been on this planet I have been through many different stages and I am thankful to Spirit every day that I continue to grow and become closer to our creator. I want to speak today to my own personal transformation throughout each element of my life. In regard to my physical existence, I have experienced an immense amount of trauma. Growing up with two alcoholic parents, one of which (my father), passed when I was ten years old has taught me more than anything about what the word forgiveness means. Not only did I have to forgive the wrongs that were done to me but I also have spent my whole life learning how to forgive myself. This to me has been a battle, as there are many things I felt I could have done differently to be a better daughter and human being in general. Through my work with my therapist and many healing guides throughout my journey, I have taken significant steps toward allowing forgiveness to fully encompass my heart and allow the energy of love to freely flow through me. I could feel from a young age that I was being called to the path of enlightenment. 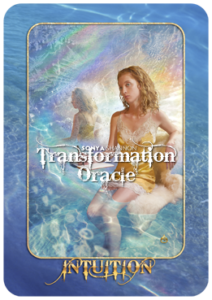 Which is what lead me to the Transformation Oracle in the first place. Spirit has consistently called me to trust my intuition and this has never lead me astray. Each new book, new thought, new connection, and new teacher has appeared to me when I allowed myself to listen completely with my heart and trust in my intuition. 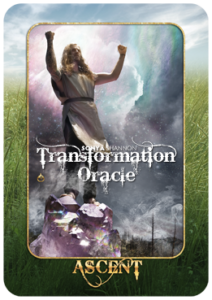 This has played a great role in my overall transformation because I truly believe I would not have as deep of a connection with the Divine had I not allowed myself to follow my heart. I am truly thankful every single day for the little voice (higher Self) that speaks to my heart and I have learned how to trust this in all aspects of my life. I am currently in the process of learning how to control the weakest part of myself, which is the mind. As humans, we are conditioned to come from a negative head space. To believe that we are not perfect and to believe that Spirit is something much bigger than ourselves. That God is something that lives outside of us instead of inside. However, I know these limiting beliefs are just that; limiting. They are false and based in the root of fear and not love. In my current situation, I believe that I am being asked to ascend from these negative thoughts that have held me back. We are all a work in progress and learning how to retrain my mind has been one of my most difficult tasks to date but I know Spirit will continue to call me to rise above my limiting thoughts in order to create the life that I was meant to live during this go around on Earth. In practicing forgiveness, trusting my intuition, and learning to control my thoughts, I have come to the place where I am renovating myself as a human being in general. Specifically, over the course of the past 9 years, I have been pulled back to Source more times than I can count in order to recreate and reinvent who I am and who I wish to be. I am living from a place of soul and the fire energy that burns in me is stronger than anything that is negative in this world outside of me. My transformation will never be finished because I believe that there is always more work to be done on self. I do know though, that through this journey, Spirit will never leave my side and will always give me guidance during the times where I lose my footing. I will forever be grateful for the daily opportunity to continue to reconstruct myself and the beautiful world around me. 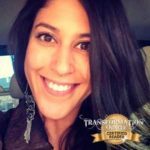 Learn how you can become a Certified Transformation Oracle Reader like Rebecca Martinez!